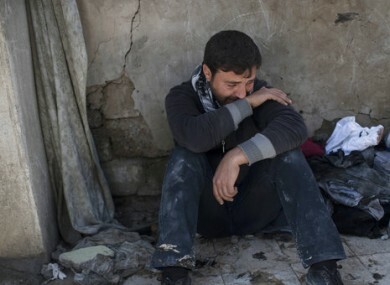 Ahmed Pesher cries next to the destroyed houses where he says 23 members of his family were killed during fights between Iraq security forces and Islamic State. THE US-LED anti-jihadist coalition has said it “probably” played a role in civilian casualties in west Mosul, as the UN and Amnesty International called for greater efforts to protect civilians. Hundreds of thousands of civilians are still inside west Mosul, caught up in deadly fighting between the so-called Islamic State (IS) group and Iraqi forces who are backed by coalition airstrikes in the battle to retake the area from the jihadists. West Mosul is both smaller and more densely populated than the city’s east, meaning that this stage of the battle poses a greater danger to civilians than those that came before. “We probably had a role in those casualties,” Lieutenant General Stephen Townsend, the commander of the US-led operation against IS, told reporters in a phone briefing from Baghdad, referring to civilians killed and wounded by aerial bombing in west Mosul. “If those innocents were killed, it was an unintentional accident of war,” he said. Townsend described the fighting in the narrow streets of Iraq’s second city as the “most significant urban combat” since World War II and “probably the toughest and most brutal close-quarters combat that I have experienced in my 35 years of service”. The coalition had previously said it carried out a strike on 17 March in an area of west Mosul in which civilian casualties were reported, and that it had opened an investigation. Iraq is also investigating civilian deaths in west Mosul, but has sought to place the blame on IS. UN rights office spokeswoman Ravina Shamdasani said yesterday that more than 300 civilians have been killed in west Mosul since 17 February. IS has targeted civilians and used them as human shields, while strikes by anti-IS forces have also left civilians dead. UN human rights chief Zeid Ra’ad Al Hussein called on Iraqi and US-led coalition forces “to undertake an urgent review of tactics to ensure that the impact on civilians is reduced to an absolute minimum”. IS’s “strategy of using children, men and women to shield themselves from attack is cowardly and disgraceful. It breaches the most basic standards of human dignity and morality,” he said. Amnesty’s Donatella Rovera said field research in east Mosul — which was recaptured from IS in January — showed “an alarming pattern of US-led coalition air strikes which have destroyed whole houses with entire families inside”. “The high civilian toll suggests that coalition forces … have failed to take adequate precautions to prevent civilian deaths, in flagrant violation of international humanitarian law,” she said. In the east, the Iraqi forces adopted a strategy of encouraging civilians to stay at home, dropping leaflets into the city with safety instructions for residents. “The fact that Iraqi authorities repeatedly advised civilians to remain at home instead of fleeing the area, indicates that coalition forces should have known that these strikes were likely to result in a significant numbers of civilian casualties,” Rovera said. Amnesty quoted Waad Ahmad al-Tai, an east Mosul resident, as saying six members of his extended family — including his nine-year-old son and three-year-old daughter — were killed after they followed government advice not to flee the city. “We heard these instructions on the radio … Also leaflets were dropped by planes. This is why we stayed in our homes,” he said. Amnesty said that, in many cases it investigated, east Mosul residents said IS fighters had been present in or near houses targeted in the strikes. In one case, five members of a family and their neighbour were killed in a raid on a house where IS fighters were hiding but the jihadists survived that attack, Amnesty quoted survivors as saying. That pattern has also been repeated in west Mosul, according to witnesses. Two witnesses who have now fled the city said that a building with around 170 people inside was destroyed in the Mosul al-Jadida area. One of them said that IS snipers had fired on Iraqi forces, after which an aircraft targeted them with a missile. Another man said that IS placed snipers atop a house where he was residing with more than 20 relatives. He was told that an air strike hit the house, an attack he survived because he was away at the time. More than 200,000 civilians have fled west Mosul since the battle for the area began, according to Iraqi authorities. Email “US says civilian casualties in Mosul were 'an unintentional accident of war'”. Feedback on “US says civilian casualties in Mosul were 'an unintentional accident of war'”.